Selenite is a very common chemical sedimentary mineral. It is an evaporate rock which is one of the three types of chemical sedimentary rocks. The other two are called Carbonate rocks, and Siliceous rocks. Evaporate rocks are formed when bodies of water evaporate leaving behind chemicals that were dissolved in them. Lakes, rivers, oceans, and ground water all have elemental chemicals dissolved in them. Salt is a well known evaporate. Most table salt comes from Utah. The Great Salt Lake is what is left of a huge inland sea that once covered most of the western United States. It is slowly shrinking in size due to evaporation. As the water evaporates the lake can no longer hold the same amount of salt. The salt precipitates out and is deposited as crystallized halite. The salt found in your kitchen is an example of this evaporate rock. Selenite forms in this same way. It is a sulfate mineral with the chemical formula Calcium Sulfate dihydrate. It is a form of gypsum. There are many crystalline forms of gypsum. Sometimes they are grouped together under the name selenite. When gypsum forms clear and colorless crystals it is called selenite. When it is opaque with fibrous texture it is called satin spar. Clusters of tabulate crystals are called desert rose. Single flattened blades pick up particles of sand and are called hourglass selenite for the distinctive shape created by the sand. Gypsum flowers form from long parallel crystals often resembling rams horns or fishtails. Another common form of this mineral is alabaster, which is often a pastel color and is very popular as a decorative stone for sculptures. This mineral gets its name from the ancient Greek word for moon or moon stone. It is very soft only a 2 on the Mo’s scale of hardness. That means that all forms of gypsum can be scratched with a fingernail. It is extensively used in making plaster and drywall. It is also used as a fertilizer and soil conditioner. It is actively mined around the world and is easy to split into thin sheets. This is called cleavage. As an evaporite all forms of gypsum will dissolve in water over time. It can form large beds hundreds of feet thick and covering many square miles. White Sands New Mexico is one such place. 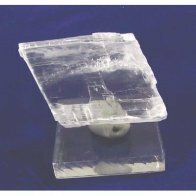 Selenite can form the largest crystals in the world. In the Naica caves in Chihuahua, Mexico single crystals can reach a length of 33 feet and weigh over 55 tons.